We provide original Mahindra Maschio Gyrovator Rotovator blade at reasonable rates. We have blades in available stock. Very reasonable rates. Very good after sales services. Transport services availabel for all india dispatch. - Usage: Used for removing the weeds, stirring, etc. Our organization has successfully expanded its business in market owing to the offered elevated quality range of Power Weeder Blade. Driven by technically advanced facilities at our ultra-modern manufacturing unit, we are manufacturing an extensive range of Rotary Tiller Blades. We have both Power Tiller and Rotovator Blades in all Types. We are engaged in manufacturing a broad array of Power Tiller Blades. 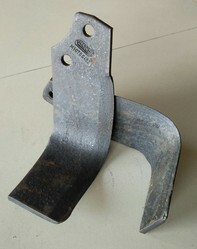 The Power Tiller Blades as the name suggests, are the right choice for tough tilling requirements requiring more power. Manufactured in accordance with industry standards, the Power Tiller Blades are widely acclaimed by clients. As a result, we have emerged as a preferred J -Type Blade Manufacturer in India. We have a exclusive range of Rotary Tiller Blades to our clients. We ensure that our range of blades is developed by utilize high grade raw material. This is done to ensure that these blades provide optimum performance on the toughest soils and also apply minimal load on the tractor. 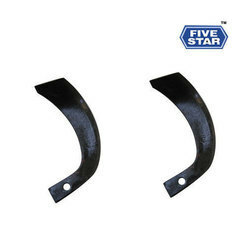 We are manufacturing and offering rotary tiller blades at a very reasonable prices along very well quality, which is made up from boron steel. Blade will never bend or break. for any kind of query please feel free to contact with us. Backed by years of industry experience, we are engaged in offering a premium quality range of Rotavator J Type Blade. With our rich industry experience, we are able to offer our esteemed clients a wide assortment of optimum quality Mini Rotary Tiller Blades. We are the original STAR Italy blades Importers since 2004. Be aware of Duplicate STAR blades in the market. We can offer you Certificate of Origin.